Natural disasters can take an enormous toll on your business. If you’re not prepared, an unexpected event can wipe out crucial data, supplies or other aspects of your business. The better prepared you are, the more likely you’ll be able to recover from a disaster quickly. There are also some actions you can take to get financial help after natural disaster strikes. By definition, natural disasters are difficult to predict or prepare for. Approximately one-quarter of businesses never open again after a natural disaster. Fortunately, there are certain actions you can take to improve the odds for your business. Identify your risks. Depending on your location, you’re more at risk for certain types of disasters than others. Is your region prone to earthquakes, floods, wildfires, tornadoes or hurricanes? 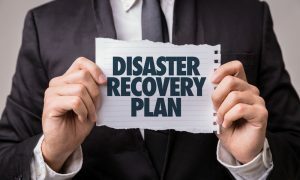 Create a disaster recovery plan for your business. Meet with your staff regularly and discuss what each individual will do in case of a disaster. Assign tasks to people and set up alternative modes of communication if the internet or cell phones are temporarily down. Back up data. Store crucial data off-site. A reliable cloud service prevents you from losing important data for your business. Review your insurance policies. If a certain type of disaster is likely in your area, make sure you have an insurance policy to cover such an event. Ordinary insurance doesn’t always cover disasters. For example, if you’re in an earthquake zone you may need a special policy to cover this type of damage. While you may have to do some cleaning up and repairs, it’s financial recovery that’s often the most challenging aspect of dealing with natural disasters. Here are 3 ways to get financial help after natural disaster strikes your area. Contact FEMA. The first step to take after a natural disaster is to apply with FEMA for financial help. They can provide money for housing along with other personal expenses such as food, clothing and medicine. Apply for business loans. You may be eligible for natural disaster loans from USDA, SBA or other government agencies. There are also special loans such as Farm Emergency Loans, Economic Injury Loans, Military Reservist Economic Injury Disaster loans, among others. Do your research and find the best financial solution for your type of business. Sign up for Invoice Factoring. You may find that your cash flow is affected by a natural disaster. Invoice factoring is an innovative way to turn this around, allowing you to get immediate cash for your invoices. Invoice factoring is different than a bank loan and allows you to get cash upfront without taking on debt. Natural disasters are a part of life. If you have a business, make sure you do everything you can to prepare for such an event. If a disaster does occur, the above guidelines can help you prepare and recover. The Small Business Administration also offers emergency preparedness training with a self-paced overview of SBA’s disaster assistance programs, resources and regulations. Invoice factoring is a type of alternative financing that can help improve your cash flow at any point, not only following a natural disaster. Riviera Finance is an industry leader in this field and can come up with a customized plan to improve cash flow for your business.